Sammy Dee Morton has played Louisiana and Texas style Blues for 25 years. His smooth, soulful and energetic way of playing has captured many an ear. Sammy Dee developed his chops playing alongside Blues and Cajun performers such as: Kenny Neal, Debbie Davies, Tab Benoit, and Doug Kershaw. He has appeared on multiple recordings, including his latest, Business Is Business and Sammy Dee LIVE, which was recorded at the Boulder Theater while opening for Robert Cray. In 2010, Sammy Dee's song, Strat Struttin' was released on Guitar Masters Vol. 3 & 4: Les Paul Dedication, BHP Music, Ltd. In 2005, Sammy was deemed an “Honorary Louisiana Bluesman” by the Louisiana Music Commission. In the 70's, Sammy Dee managed a recording studio and used his off hours to further develop his musical talents. His goal was to create his own style. Over the years, Sammy discovered his longing to master the Blues. In the 80's, he played 6 years in a shag band in South Carolina and this helped to develop his strong command for rhythm. Later on in his life, while touring with Doug Kershaw (the Rajin Cajun), Sammy found himself at the New Orleans Jazz Fest opening for greats like Al Green and B.B. King and at Austin Texas, Steppenwolf. Sammy Dee spent five and a half years touring with Doug in the U.S., Canada and overseas. Also, he spent a while living in Louisiana near New Orleans and played with several special musicians which added more influence to his playing style. In 2004, he released his first all original album, Redheaded Stepchild which is available worldwide. 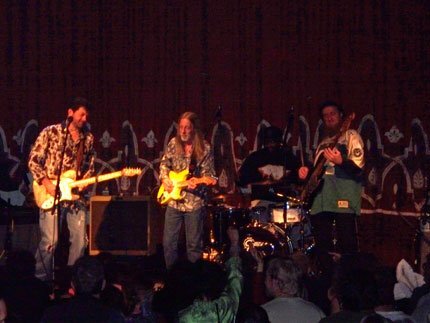 In 2005, Sammy Dee toured coast-to-coast on his Red White and Blues Tour in support of the album. And while on tour at his show in Hammond, Louisiana, was awarded by Official Louisiana State Decree as an "Honorary Louisiana Bluesman", a rare and respected recognition. Sammy Dee Morton believes in the immortal words of the great Albert Collins, "let your influences shine through". With a life steeped in the traditions of blues and a stunning style all his own, Sammy Dee is sure to please Blues fans young and old.